If you’re like us, the words ‘Washington State’ bring to mind incredible images of natural beauty and a wealth of opportunities for hiking, kayaking and heading off the beaten track. 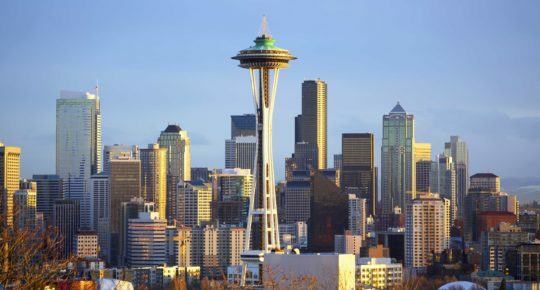 Now that we fly direct from Dublin to Seattle, it’s the perfect time to get to know all that Washington State has to offer. One way is by road on a circuit that loops the Olympic Peninsula. 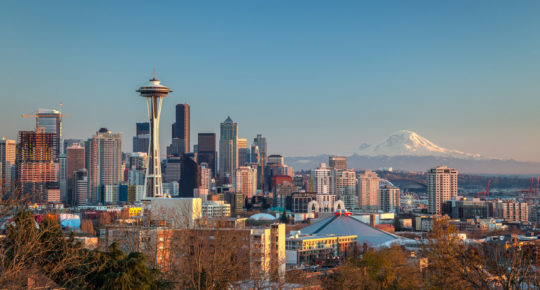 Located just west of Seattle, this road trip offers epic mountain views, rainforest hikes, deserted beaches, and the chance to get up close with local wildlife. The itinerary below is for three nights, but you could easily extend that to five or six and take more time to enjoy the hiking trails on offer. Claim your bags in Seattle-Tacoma International Airport, exit the terminal building and jump on the designated shuttle bus to the rental car centre. You’ll find all the major car rental companies there. 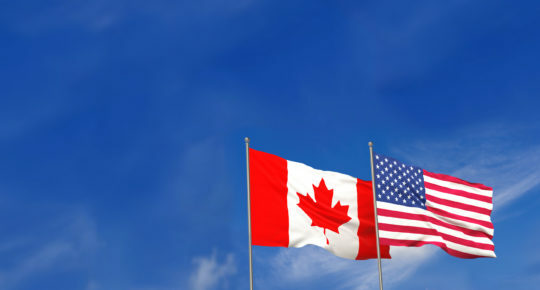 For the best rates and to save time on arrival, make sure you book in advance at www.aerlinguscars.com. Your road trip starts here. From the airport, head south on Interstate 5 towards Olympia, Washington’s state capital. It’s about a one-hour drive from the airport to Olympia, so there’s no need to stop along the way. 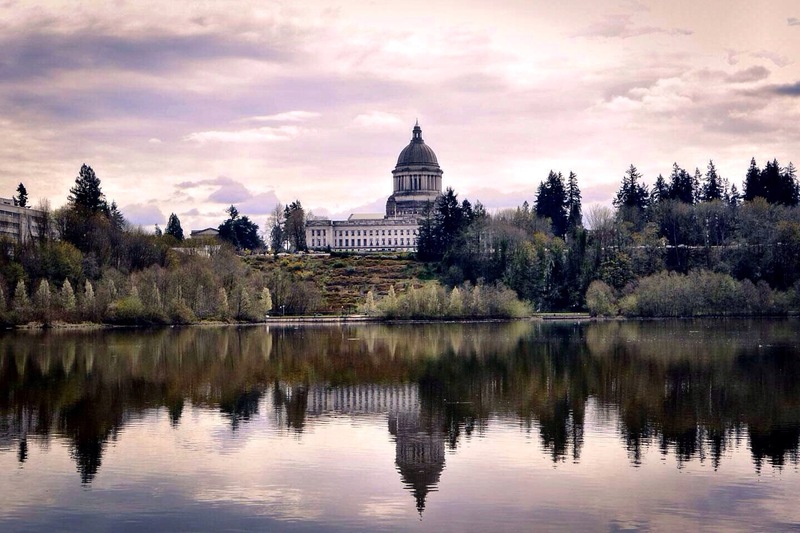 Spend the night in Olympia and plan for an early start the following morning. Hit the road early and head west towards the coast and the City of Aberdeen. This was the hometown of Kurt Cobain, and a number of locations in the city are linked to the legendary songsmith. Kurt Cobain Landing, nestled at the end of East 2nd Street on the south bank of the Wishjak River, is an open green space dedicated to the Nirvana frontman. Continue your drive west on U.S. Route 12 (Olympic Highway), then turn off in Hoquiam heading north and be amazed at how the landscape changes as you enter Olympic National Forest. The drive from Aberdeen to Lake Quinault should take you just under an hour. Lake Quinault is nestled in a glacial valley and surrounded by the lush temperate rainforest that’s typical of Olympic National Forest. Visit the picturesque lakeshore in front of the Lake Quinault Lodge, and take some time to visit the world’s largest Sitka Spruce – standing 191 feet tall, this giant is about 1,000 years old. Activities in the area include river rafting, hiking and fishing. Continue your drive along U.S. Route 101, back to the Pacific Coast, and then north to Ruby Beach. Here you’ll see the huge driftwood logs that populate much of the Olympic Peninsula coastline. The massive logs are an impressive sight, made even more stunning against the backdrop of the many sea stacks dotted around Ruby Beach. When you’re ready, get back on U.S. 101 and head north for another 14 miles. Turn right at the sign for Hoh Rain Forest Visitor Center. This brings you along a majestic drive through Hoh Valley. 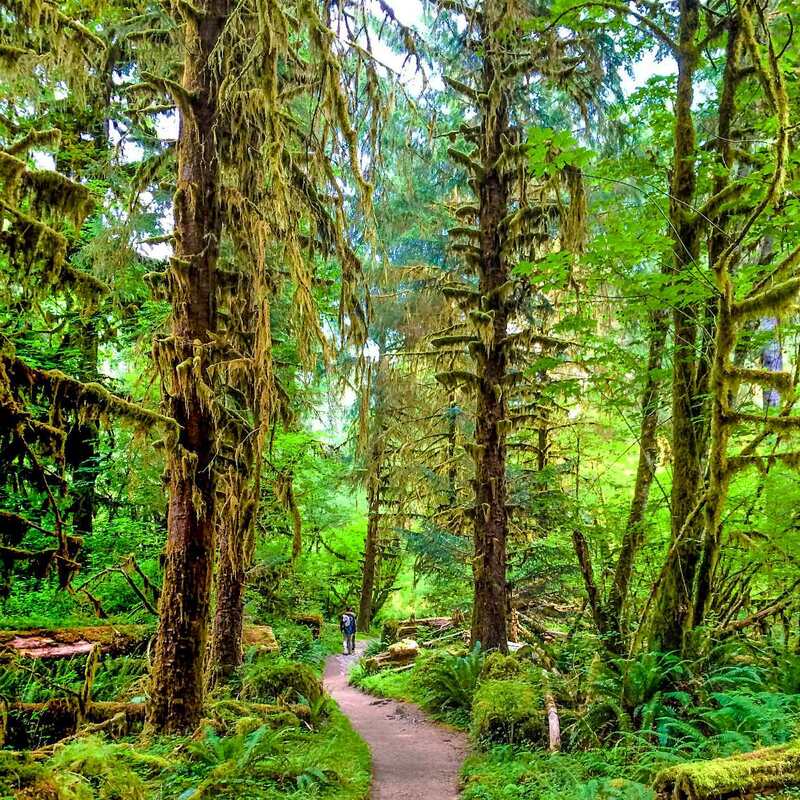 The Hoh Rain Forest is one of four rainforests on the Olympic Peninsula, but it’s the only one to have been designated a World Heritage Site and a Biosphere Reserve by UNESCO. The drive to Hoh Rain Forest Visitor Center takes you deep into Olympic National Park. Two short nature trails loop through the forest near the Visitor Center – the Hall of Mosses Trail (0.8 miles), and the Spruce Nature Trail (1.2 miles). There’s only one route into and out Hoh Valley, so your next section of driving involves backtracking to Route 101, then turning right and north towards Forks. This relaxed town (pop. 3,558) is where you’ll spend your second night of the trip. Recently, Forks has become famous as the setting for the Twilight series of novels and movies. Twilight and vampire references can be found all over town. 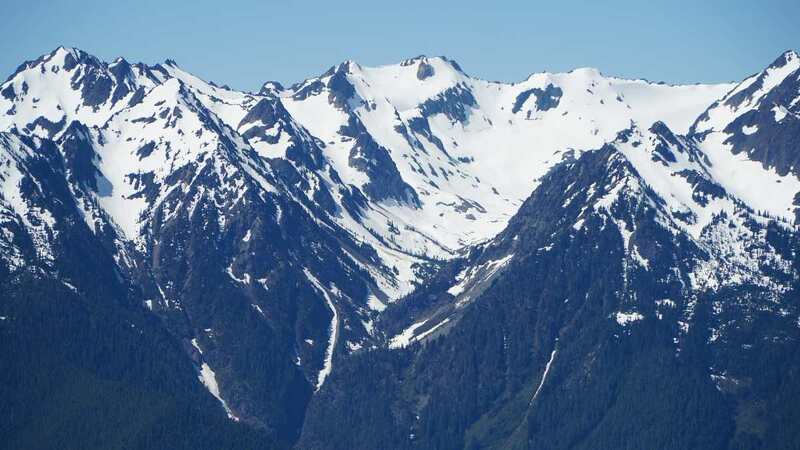 You’ll be putting in a lot of miles on the second morning as you head north out of Forks, following Route 101 as it veers east over the top of Olympic National Park. The road passes along the shore of Lake Crescent, which, if the sun is shining, is a stunning setting for a smug Instagram post. When you arrive into Port Angeles, follow signs for Hurricane Ridge. There’s a visitor centre just outside the town as you enter the National Park in case you need any info. This section of driving is one of the most epic of the whole trip. As the road winds upwards through snow-capped mountains, you’ll realise that this landscape is exactly how you imagined Washington State. Just where the road comes to an end, the Visitor Center at Hurricane Ridge presents an amazing vista. Here you can see for miles across the uninhabited mountain range. In season, this is a location for skiing and snowboarding. Turn around and head back down towards the Strait of Juan de Fuca, the inlet that separates the Olympic Peninsula from Vancouver Island to the north. This time you’ll be on the valley side of the road, which makes the drive that bit more hair-raising! Between Port Angeles and Port Townsend, we took a detour into Dungeness. 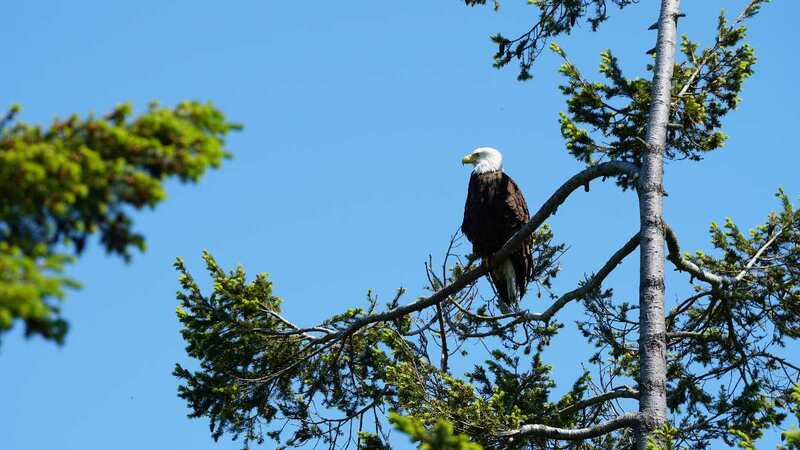 The highlight was discovering three bald eagles holding court in the treetops along Marine Drive. A local told us that they’re often found there, so it’s well worth the extra few miles for the chance to see them. Follow the 101 to Discovery Bay, then turn left on Route 20 all the way to Port Townsend. Port Townsend is a Victorian seafront city of 9,100 people with an interesting history. It’s a great place to cap off a long day exploring the Peninsula. As the city began to take shape as a safe harbour in the mid to late 1800s, there was widespread speculation that it would become the largest harbour on the west coast of the United States. This fuelled a lot of construction in the Victorian era and many of these buildings have been beautifully preserved to this day. The city has a laid-back and bohemian vibe, and there are plenty of interesting spots to check out for sundowners. History buffs will also enjoy a visit to nearby Fort Worden State Park and Point Wilson Lighthouse. The Port Townsend to Coupeville ferry will take you across to Whidbey Island for the last day of the road trip. As we had a plane to catch out of Sea-Tac later that day, we made our way straight to Deception Pass State Park. 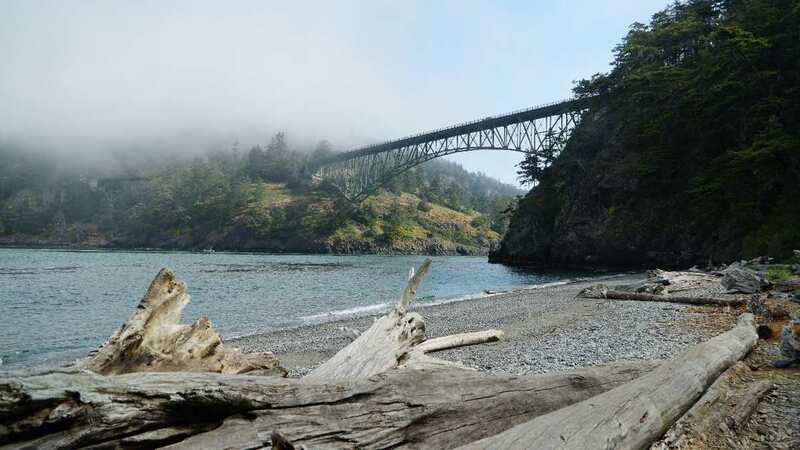 This is Washington State’s most-visited state park, and the big attraction is the Deception Pass Bridge, which connects Whidbey Island to Fidalgo Island. The bridge opened on July 31, 1935. Spreading over 3,854 acres, the park itself presents many opportunities for hiking, camping, fishing and canoeing. Close out your Olympic Peninsula loop with a drive back down Interstate-5, through Everett, and into Seattle. Pike Place Market, great coffee, an epic musical heritage… need we say more? 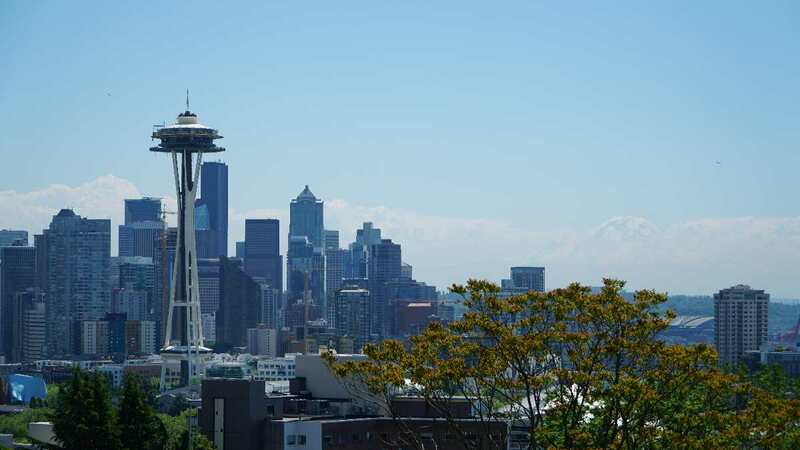 To plan your stay in this gorgeously laid-back city, read our 12 incredible things to do in Seattle. 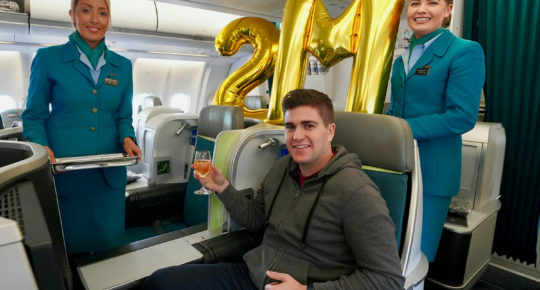 Book your adventure to the Pacific Northwest and drive along the Olympic Peninsu today on aerlingus.com. WATCH: Road trip around the Olympic Peninsula. Read next: Six American road-trips you need to take in your lifetime.